This morning was the holiday party at the gym. The theme this year was “Ugly Sweaters”. Clever, right? Cari and I purchased matching sweaters months ago and they are hysterical, but she texted me this morning to tell me that she couldn’t make it. I know we are all busy this time of year, but who is more important at Christmas than your besty? Röbby could tell I was sad and he offered to take the littles off to school for me. When he got home he had bought matching sweaters for him and me to wear to the gym. What a sweety! They sure are ugly. Not exactly ugly like the other sweaters, but he was soo cute to try. The party was fun and everyone was so happy to see my handsome hubby there. The past week I have felt closer to him than I ever have before. I might even go cross country skiing with him sometime, LOL! One weird thing happened. I thought that I saw Cari down the corridor from the boxing room. I called her name and waved but she just disappeared into a locker room. I could tell Röbby had seen her too. He was so upset for me that he turned bright red. She must be really excited about my Christmas present! 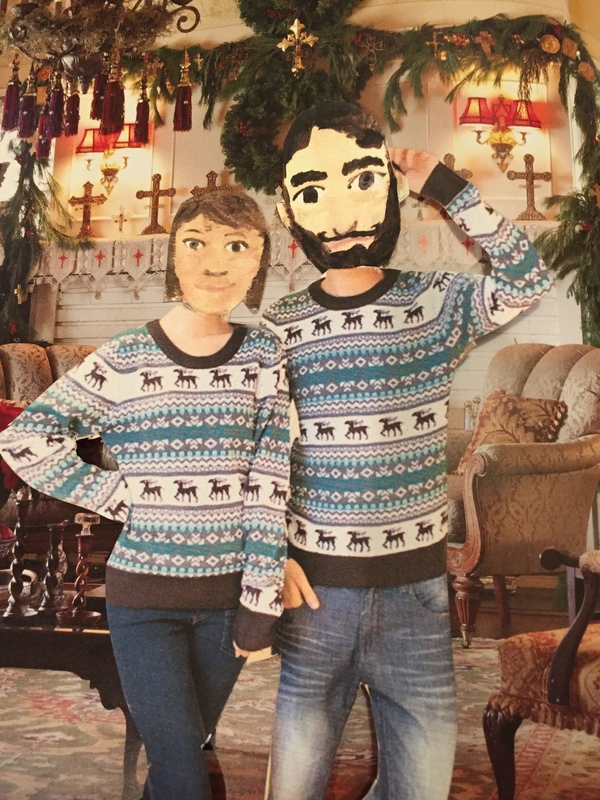 This entry was posted in Holiday fun and tagged Cari, Gym, Holiday party, Röbert, ugly sweaters on December 22, 2015 by mythreeangles. Stock up on wine, chocolate and ice cream. Seriously, do it now. I’m good on the wine. You are very intuitive and I think you are indeed going to receive a big surprise, especially with Cari and Robert collaborating! Sounds like you have done everything possible to ensure this will be a memorable holiday. I can’t wait to unwrap my gifts! Gosh, you guys are the cutest couple ever! So inspirational! And Cari is obviously bursting to tell you about your Christmas surprise! I can’t wait to hear about it! We are so cute together! I don’t know what is up with Cari, but I don’t feel good about it. Who would ghost their besty like this? Y’all look adorable! I sure hope you can convince Bobsers to shave that beard for the New Year! Thanks Cindy. How did you get John to shave his POW one? Oh that wasn’t you. Never mind. My dear, that was his starter wife. He was already mostly trained when he came to me. Of course he had a few rough edges I had to file down. Such a darling man. I don’t know Lah Lee, Cari is acting pretty suspiciously, especially if she is only worried about spilling the deets about a new bracelet. I wonder if she has spend some of her inheritance buying you a truly fantastic Christmas gift? My advice is to make sure you buy her something chic and very expensive to counter her epic gift. Gosh, could you imagine being upstaged by Cari like that, how embarrassing! I actually returned her gift and bought something nice for myself instead today. “He” certainly seems to feel guilty about it. So I kind of agree with you on the cake thing. Oooh, now I get what you’re doing. Touché, Lah Lee, you’re being smarter than ever. Such a potentially lucrative strategy – if I may just suggest scrubbing every mention of Stefan from your blog. You’ll find this useful when the day comes. As to Cari’s new fling, I wouldn’t be so sure that he’ll leave his family for her. Seems like a have his cake and eat it too kind of guy – these types usually lack the courage to leave. I wouldn’t be surprised if he’s been straying before, with a neighbour, for example. Nonetheless, his betrayed wife should take him for all he’s worth, especially if she can prove that he has been stringin her along for quite some time. Just my two cents. Cari is also pretty clingy and selfish when it comes to men, so she may not be in complete control of this sitch. Maybe Cari has a twin or something? I bet your Steeling is missing her little fiend, Cari’s daughter, isn’t she? Starling and Amber see each other at school every day, but Starling has become much more popular this year and has many friends. She spends a lot of time with Fat Alice and Alcott. i thought fat alice isn’t fat anymore? couldn’t you at least call her used-to-be-fat alice? But you know who I am talking about, right? Why does it matter to you? Webster’s says either is fine. I made that up, Who cares?